Mayo 0-8 Roscommon 0-4 (MacHale Park, 24/1/1982). MAYO: M Webb; M Gavin, J Gallagher, M O’Toole; H Gavin (0-1), T Kearney, M Connolly; TJ Kilgallon (0-1), J Lyons (0-1); T O’Malley (0-2), J Burke, D McGrath; T Reilly, E McHale, M Carney (0-3). Galway 0-9 Mayo 0-7 (Pearse Stadium, 31/1/1982). MAYO: M Webb; M Gavin, J Gallagher, M O’Toole; H Gavin, T Kearney, M Connolly; TJ Kilgallon (0-1), J Lyons; T O’Malley (0-3, all frees), J Burke, D McGrath; T Reilly, E McHale (0-1), M Carney (0-2, one free). Subs: J McGath for Reilly, WJ Padden for D McGrath, A Egan for McHale. Mayo 1-10 Offaly 0-9 (James Stephens Park, Ballina, 21/2/1982). 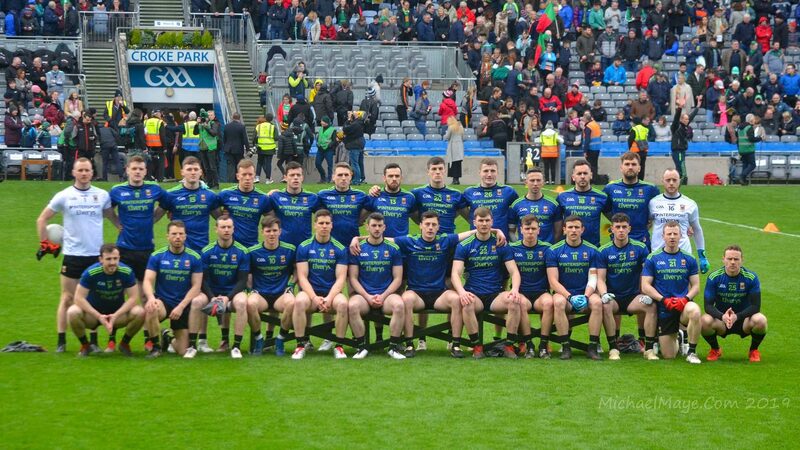 MAYO: M Webb; M Gavin, J Gallagher, M O’Toole; H Gavin, T Kearney, M Connolly; TJ Kilgallon (0-1), W Nally; A Finnerty (0-2), J Lyons (1-1), D McGrath (0-4); E McHale (0-1), J Burke, M Carney (0-1). Sub: J McGrath for Lyons. SEMI-FINAL: Leitrim 1-7 Mayo 2-7 (Pairc Sean Mac Diarmada, Carrick-on-Shannon, 13/6/1982). MAYO: M Webb; M Gavin, J Gallagher, M O’Toole; H Gavin (0-1), T Kearney, M Connolly; W Nally, WJ Padden (0-1); T O’Malley (0-3), J Lyons (1-0), D McGrath (0-1); T Reilly (1-0), J Burke, J McGrath (0-1). Subs: G Cuddy for D McGrath, TJ Kilgallon for Nally. FINAL: Galway 3-17 Mayo 0-10 (Tuam Stadium, 11/7/1982). MAYO: M Webb; M Gavin, J Gallagher, M O’Toole; H Gavin, T Kearney, M Connolly; TJ Kilgallon (0-1), WJ Padden (0-1); J Lyons, J Maughan, M Carney (0-6, four frees); E McHale, J Burke (0-2), T Reilly. Subs: A Garvey for Connelly, A Egan for Gallagher. Dublin 3-7 Mayo 0-6 (Croke Park, 10/10/1982). MAYO: M Webb; M Gavin, A Egan, T Kearney; A Garvey, E Lavin, M Connolly; TJ Kilgallon, B Molloy; T O’Malley, J Lyons (0-1), J Lindsay; G Geraghty (0-2), J Burke, M Carney (0-2, one free). Subs: E Melvin for Garvey, S Clarke (0-1) for O’Malley. Mayo 0-7 Cork 0-10 (Claremorris, 31/10/1982). MAYO: M Webb; M Gavin, E Lavin, T Burke; M Connolly, T Kearney, D Flanagan; TJ Kilgallon (0-1), G Geraghty (0-1); S Clarke, J Burke, J Lindsay (0-2); B Molloy, J Lyons, M Carney (0-2). Subs: P Dixon (0-1) for Molloy, D Mellett for Kilgallon, WJ Padden for Clarke. Derry 1-6 Mayo 0-7 (Bellaghy, 7/11/1982). MAYO: M Webb; M Gavin, E Lavin, T Burke; T Walsh, D Mellett, D Flanagan; B Molloy, WJ Padden (0-1); G Geraghty, P Dixon (0-3), J Lindsay, M Carney (0-3). Subs: A O’Connor for Lindsay, J Monaghan for Molloy. Mayo 0-9 Armagh 3-4 (Ballyhaunis, 21/11/1982). MAYO: M Webb; M Gavin, A Egan, H Gavin; J Monaghan, D Mellett, D Flanagan; B Molloy (0-1), J Lyons; S Clarke, P Dixon (0-1), M Carney (0-2); G Geraghty, J Burke (0-1), C Loftus (0-3, frees). Subs: E McHale (0-1) for Geraghty, H Lynn for Carney, TJ Kilgallon for Lyons. PRELIMINARY ROUND: Mayo 5-12 Leitrim 0-8 (Claremorris, 27/6/1982). MAYO: S Warde; JJ Gallagher, P Forde, E Gibbons; D Flanagan, PJ Moran, A Walsh; G Geraghty (0-1), TJ Kilgallon (0-2); T Reilly (0-1), J Maughan (0-2), J Moylette (0-1); P Duffy (3-2), J Doherty, L Lyons (1-3). Subs: J Boyle for Moran (inj. ), M Kearns (1-0) for Doherty. SEMI-FINAL: Roscommon 0-13 Mayo 1-10 (Dr Hyde Park, 23/7/1982). MAYO: S Warde; J Boyle, P Forde, E Gibbons; D Flanagan (0-2), PJ Moran, A Walsh; J Gavin, G Geraghty; T Reilly, J Maughan (0-2), J Moylette; P Duffy (0-6, five frees), J Doherty, L Lyons (1-0). Subs: M Kearns for Gavin, JJ Gallagher for Moylette. SEMI-FINAL (REPLAY): Mayo 1-9 Roscommon 1-10 (Claremorris, 1/8/1982). MAYO: S Warde; PJ Moran, P Forde, E Gibbons; J Boyle, JJ Gallagher, D Flanagan (0-3); G Geraghty (0-2), J Doherty; M Kearns, J Maughan (0-1), J Moylette; T Reilly (0-1), L Lyons, P Duffy (1-2). Subs: J O’Boyle for Duffy, M Byrne for Boyle. SEMI-FINAL: Mayo 1-5 Leitrim 2-5 (Claremorris, 27/6/1982). MAYO: TJ Rogers; N Mullen, G Mahady, J Gilmore; A McGarry, N Walsh, S Finnegan; P Brogan (0-2), H Brennan; B Kilkelly (0-1), V Daveron, M Molloy (0-1); J Gavin, A McHale, K Reilly. Subs: P Donoghue (1-1) for Daveron, P Higgins for Molloy, J Kilroy.